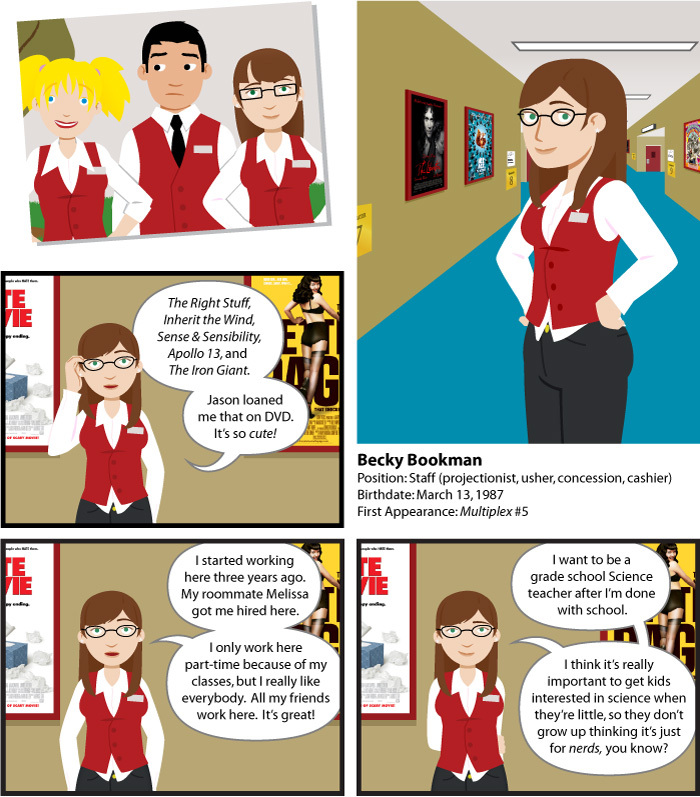 Becky found her way to the Multiplex 10 by way of Melissa, her college roommate. She started as general staff before gravitating towards primarily working as a projectionist, because of her rapport with the projectors. Despite her scientific inclinations, Becky has a bit of a romantic streak, and especially loves Jane Austen. Becky long harbored a crush for Jason before he started dating Devi in 2006. The following winter, she began seeing Jay from Flickhead Video, the video store two storefronts over in the strip mall the Multiplex 10 is in, but he broke up with her because he felt she was still in love with Jason. Soon after Devi and Jason broke up, he attempted to kiss Becky — on the anniversary of his first kiss with Devi, in the same location — infuriating Becky, who immediately went to Flickhead Video and asked Jay to give her another chance. Things seemed to be progressing well, as they became officially boyfriend/girlfriend. But over time, Becky seemed to be more comfortable than in love. Taken by surprise when Jay proposed to her on Valentine’s Day, Becky's reaction was… not what he had hoped, and the two split up. Becky had a relatively brief, more or less physical relationship with the former lead singer of Whitey’s band, Dominic. She stayed single for a long time, but when a thinly veiled line in the gang’s zombie movie about Jason's never-totally-forgotten love for Becky finally made her realize his real feelings for her, she took action, and they’ve been together since. Becky and Franklin were promoted to Co-Lead Projectionists in April 2010. Becky has a Master’s of Education (K–12) degree and, while it took her a long time to find a position as a Science teacher, she began substitute teaching in the fall of 2012, cutting back to only part time status at the Multiplex 10 and stepping down from her Lead Projectionist position in the process. She was offered a more permanent position at the Science Academy of Chicago in February 2013. After one last summer at the Multiplex 10, she left to be a full time teacher.